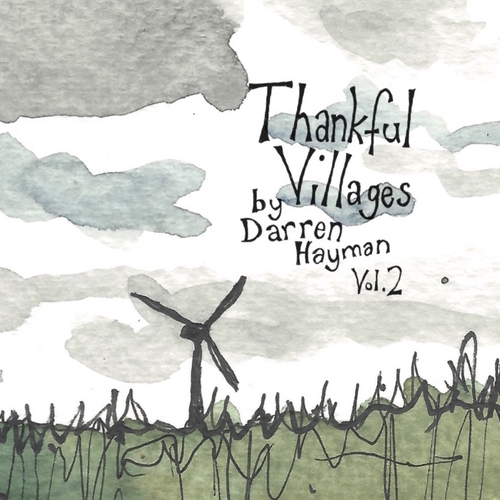 Following the success of Thankful Villages Volume 1, English songwriter and former Hefner frontman Darren Hayman continues his journey around the United Kingdom’s 54 Thankful Villages. A Thankful Village is a village where every soldier returned alive from WWI. An ongoing and hugely ambitious folk project, Thankful Villages is only partially concerned with the war itself: moreover it is a celebration of British rural life. Darren pulls together first person interviews, folk tales and songs, field recordings and his own personal experiences to create a vast patchwork depicting community, history and legend. Thankful Villages Volume 2 is less an album but something akin to an arcane musical radio documentary. Themes of “the river” and “death” weave their way through these eighteen villages. A centuries-old drowning is uncovered in “Arkholme” on bonfire night. Dennis, the river man, tells us of a tragedy on the Weir in “Cromwell”. Judy Dyble, the original singer of folk legends Fairport Convention, joins Darren in the village of “Upper Slaughter” and sings a lyric about the generations flowing like water through the village. Darren uncovers two WWII air disasters in “Woodend” and “Wrigsley”, where he records in the abandoned control tower at the airfield, the so-called cemetery of lights. Perhaps the most shocking and miraculous of tales is found in “Flixborough” where in 1974 the local plastics factory exploded, killing everyone inside but nobody in the lucky village. Derek and his son tell us the story of finding each other amongst shards of glass. Glimpses of light shine through the darkness; a sunny day of wild swimming in “Telisford”, a village fete with bell ringing in “East Norton” and a tale of a grateful Belgian Refugee in “Norton Le Clay”.